Your wrapping paper can be tailored to your brand, occasion, or event. Whether for personal or business events, you can give personalized gifts, right down to the packaging. Use it for wedding, birthday, or Christmas gifts for wrapping that will be as meaningful as the gifts inside, and be remembered for years to come. 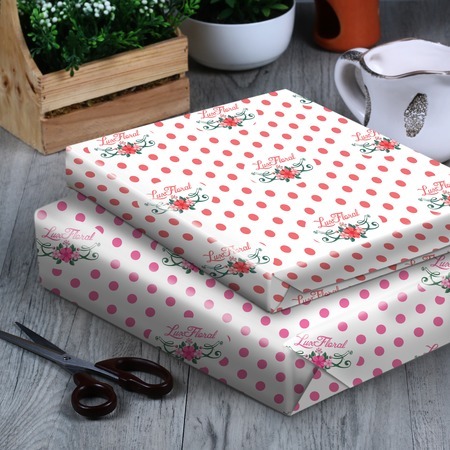 Print custom wrapping paper for gifts and branded packaging. Branded gift wrap is suitable for covering a wide variety of products. It's an excellent choice to complement other marketing materials when you add a logo patterned on the paper. You could also include a specific theme to better fit a marketing strategy, or to give away during special events. Our custom wrapping paper is printed on 70 lb. uncoated paper, a high-quality paper stock derived from sustainable sources. This uncoated stock offers excellent writability and a classic feel you would expect from a premium paper, which will make the impression you want. Choose from a variety of standard and custom options.